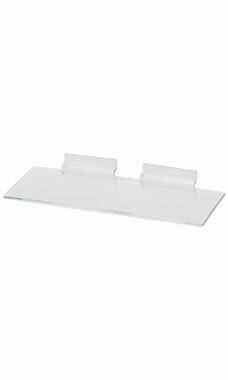 Clear Plastic Shelves for Slatwall - 4" x 10"
These 4''W x 10''L, 1/8" thick Clear Plastic Shelves for Slatwall display a single shoe beautifully. Designed for use with slatwall, these shoe shelves are a must have for any shoe retailer. Have other small trinkets and knick knacks? These small plastic slatwall shelves are handy to have around while displaying other small items, as well. In clear, the shelf will match any wall display perfectly, providing you with a clean, sleek look, designed with your own personal touch. In stock and available for same day shipping. I have found that I prefer the shelves with lips to keep items from falling. They are very reasonably priced and make the shoe display look great. Fits perfect and better value than the glass shelves and makes a better looking presentation. These are perfect size for my wall slats to accommodate products that do not need the larger shelve. Sleek and very modern looking. Good for lighter weight items, displays nicely and doesn't sag under the load. Little did we know how fabulous these little acrylic shelves would be til we started using them - which caused us to immediately order more. I really like these little shelves. They are sturdy and great for displays. A modern simple take on a shoe shelf. This product helps gain space on existing walls and keeps the footwear wall looking clean and the shoes looking like they are floating. Shoe displays are perfect. Came super earlier compared to what we thought. Only bad thing is shipping. This was my first purchase with Suppystore. After placing the order one day I called to change the color the next. Their staff was very curious and willing to help me correct my order. It shipped the same day I placed the correction. The products I purchased where the lowest price I was able to find anywhere. The quality is very good with a high polish on all the hangers. I will purchase from your store again , thank you. I hope to be able to add holes to these and use without slat wall as well.